A first-of-its kind study set to be released Monday finds that older adults who engaged in brain training drills retained measurable benefits up to 10 years later, suggesting that such interventions may help stave off impairments of aging that rob seniors of their independence. The trial, which involved roughly 2,800 participants from across the country, including Massachusetts, is by far the largest and longest such study to date. As baby boomers search for ways to stay mentally sharp, the popularity of brain games has soared in recent years, but researchers have decried a lack of rigorous evidence showing these interventions are effective in the long term. Most brain games on the market involve computer exercises. But in the new study, researchers used paper-and-pencil tests that honed problem-solving involving letter and number patterns, in addition to computer drills that tested the ability to quickly distinguish an image among a constantly changing screen. Just one computer drill used in the study is on the market, and it has been altered from the version used by researchers. 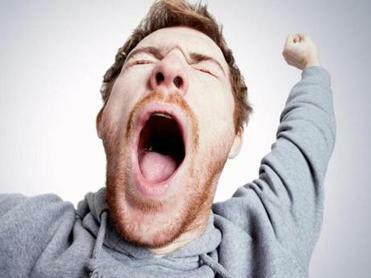 America is chronically sleep deprived and Dr. Charles Czeisler wants to do something about it. The latest trial found that nearly three-quarters of those who participated in reasoning exercises and information-processing drills still displayed those abilities a decade later. Scientists not involved with the study called it unique and provocative, and said it unquestionably shows that older adults who receive brain training are able to maintain those skills over the long term. The federally funded study appears in the Journal of the American Geriatrics Society. Study coauthor Sharon Tennstedt, vice president of New England Research Institutes, said results of the brain training suggest that it helped participants carry out everyday activities as if they were about 10 years younger, allowing someone at 80 to function more like a typical 70-year-old. “If these training interventions can have that kind of effect on preserving cognitive function, then there is potential for either delaying dementia or kind of attenuating it,” said Tennstedt, whose Watertown institute conducts a wide range of scientific studies, mostly with the National Institutes of Health. She stressed that the findings do not indicate brain-training is a way to prevent dementia, but rather to slow its arrival. The $33.7 million study was paid for by the National Institutes of Health and overseen by Jonathan King, a program director at the National Institute on Aging. King said that although many adults worry they will develop Alzheimer’s disease, the majority will not be plagued by dementia. Most, though, will eventually be stymied by changes in their ability to reason and process information quickly, jeopardizing their independence, which is why the government is focused on easing that burden, King said. “So the quest becomes, can we enhance cognitive ability in older adults that would allow them to live independently longer?” he said. The study volunteers, with a median age of 74, were divided into three groups, each receiving training in either reasoning tips, computer games designed to boost their speed at processing information, or memory strategies. A fourth group received no training. The training groups participated in 10 sessions, each lasting about 60 to 70 minutes over five to six weeks, with some participants randomly selected for later booster sessions. The study measured effects immediately following each session, and at various intervals up to 10 years later. 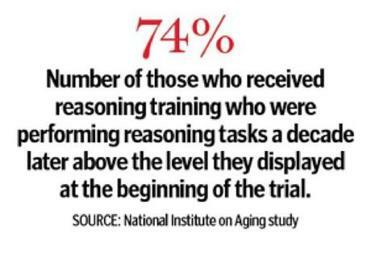 About 74 percent of those who received reasoning training were still performing reasoning tasks a decade later above the level they displayed at the beginning of the trial, compared to about 62 percent of those who did not receive that training. Similarly, 71 percent of speed-trained participants were performing a decade later at or above levels at the study’s start, compared to just 48 percent of those who did not get training. No such difference was observed in memory skills between those who received specific memory training and the untrained group. Scientists are not sure why the memory training did not seem to help with memory a decade later, but hypothesized that changes in the brain as we age may make the brain less amenable to such interventions. One other finding intrigued the researchers. Participants in all of the training groups said they had less trouble performing everyday tasks a decade later, compared to those who underwent no training. Roughly 60 percent of those who participated in the sessions reported they had less difficulty with activities such as shopping, preparing a meal, and handling finances, compared to 49 percent of those who did not have the training. But standard tests conducted by the researchers, such as measuring the amount of time that participants took to read and understand prescription labels, did not pick up that benefit. King said it may be that researchers simply have not designed sufficiently sensitive tests to detect these differences. Denise Park, a brain researcher at the University of Texas at Dallas who was not involved with the study, said the research was well designed and clearly demonstrated that older adults trained on a specific task can maintain that skill for a decade. Park said the study, however, lacks answers for why the training appears to work, and she said future research may use brain scans to help answer such questions. “We need to look under the hood, to see how the training immediately changed their brains and how it changed their brains over the long term,” said Park, codirector of the Center for Vital Longevity. Only one of the tests used in the study has been sold so far to a private company. Posit Science bought the test that measures information-processing speed and created a reprogrammed version. The National Institute on Aging funded a study on the Posit Science version to determine whether it was effective. The study, published last year, was much smaller than the latest study, involving 620 people and tracking participants for only one year, but it did find small to moderate benefits. Kay Lazar can be reached at Kay.Lazar@globe.com Follow her on Twitter @GlobeKayLazar.